We are offering a fantastic chance to win a once-in-a-lifetime experience onboard British sailing champion Alex Thomson’s racing yacht. Alex broke the world distance record for the furthest distance sailed on a monohull in 24hours in last year’s Vendee Globe. 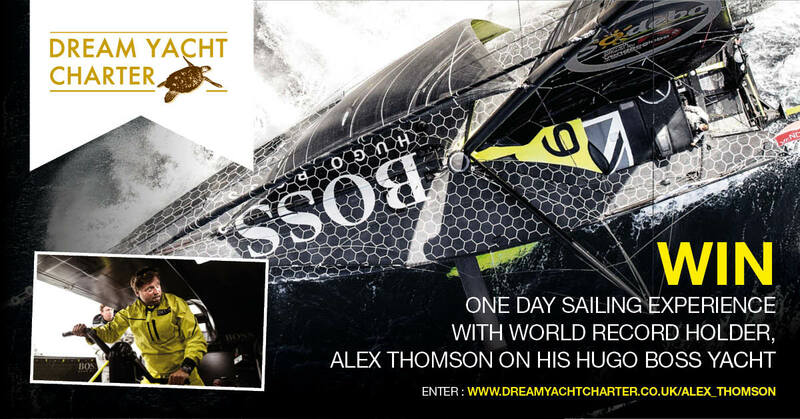 Enter our competition and you and a guest could sail with Alex on his record-breaking HUGO BOSS Open 60 yacht on The Solent, Gosport, on 16 April 2018. The competition is in association with our media partner, Yachts & Yachting. Don’t miss this opportunity to experience a day you’ll never forget and the thrill of extreme sailing with one of Britain’s most successful sailors. The prize is a one-day sailing experience on 16 April 2018 on Alex Thomson’s yacht HUGO BOSS Open 60 from Gosport on The Solent, England. Applicants need to be over 18 years of age. You do not need to be a Dream Yacht Charter customer to enter. You do not need to live in the UK to enter but you need to be in the UK on 16 April 2018 to take part in the prize. Please read the full Terms and Conditions before entering. Book your bareboat yacht, all-inclusive cabin and luxury crewed charters with Dream Yacht Charter, the world’s leading charter company. Sail the world from our wide range of bases across +47 destinations. Choose from our diverse fleet with +900 yachts from a broad range of manufacturers. Launched in 1947, Yachts & Yachting is recognised the world over as essential reading for anyone with a passion for competitive sailing. Whether you want to know more about the America’s Cup or Round the Island Race, dinghies, keelboats or cruiser-racers, Yachts & Yachting provides essential advice for the racing sailor who wants to finish ahead of the competition.